As I think a great many people do nearly every day now, I was surfing through some social media posts and I came across this image. 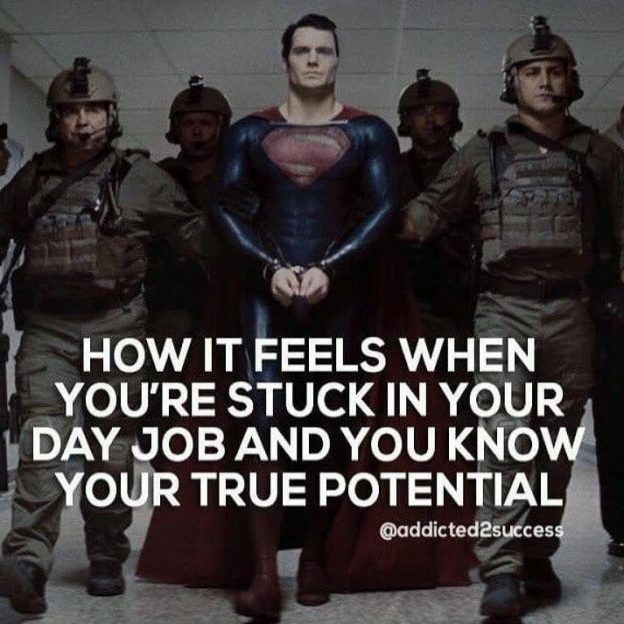 Courtesy of @addicted2success, the image shows Superman in handcuffs and accompanied by four soldiers in body armor, etc. 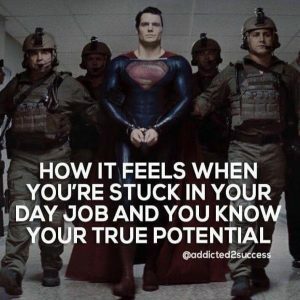 It’s an image from the movie “Man of Steel.” The phrase on it is what caught my attention: How it feels when you’re stuck in your day job and you know your true potential. I imagine a lot of people know what that feels like. So many of us, especially when we’re just starting out in the work force, know what we’re capable of and don’t really feel like our employment / employer allows us to explore our full capabilities. That’s one thing; that’s allowing (or just experiencing because it happens a lot) the conditions of your employment or the people you work for to artificially limit your performance. It’s when you know you can do more, but the situation doesn’t permit you to do more so you feel trapped or limited. Make no mistake: This happens to EVERYONE. I clearly remember being a 19-year-old military police officer thinking I could be doing so much more. I was completely unaware of the amount of experience I needed to gain before I could be all I saw myself as, but I was motivated, energetic, eager and ready to work toward my goals. 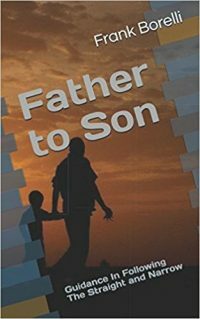 I felt I was held back by a set of circumstances that didn’t recognize my true value and potential. But here’s my thing, and it’s all about Superman specifically being shackled. The conditions he’s in aren’t limiting him. The men around him aren’t limiting him. The location and everything else… none of that is what’s limiting him. He’s limiting himself. Every Superman fan knows that the handcuffs are chump-change to him. He’d snap them without thinking. In fact, he’d probably do it by accident if he didn’t concentrate on not breaking them. He’s not being led by those men. He’s going along quite willingly. He’s not walking along because he has to. He’s walking along because he chooses to. Otherwise he’d just fly away through the ceiling. In that image, what’s limiting Superman’s potential is Superman. That made me think: how many of us limit ourselves in such a fashion without realizing it? Or while blaming it on something else and not taking responsibility for it? Are the limits or restraints you experience real? Or are you creating them for yourself? Too many of us create our own limits or restraints with excuses. “I can’t start doing that until…” “If I do that then so-and-so is going to be unhappy.” “There’s too much risk involved in that; I’m not sure I can do it even though I really want to and I think it’ll turn out okay in the end.” Have you thought any of those? Do you recognize them for what they are? Just excuses you tell yourself (because no one else believes them) to keep yourself safe; secure; not taking risks; not risking failure or rejection or whatever else you fear. STOP. Stop limiting yourself. “I could be so much more if I just had a different job.” GO FIND ONE. The classifieds are still a real thing. “I could do _______ if I was just in better shape or a few pounds lighter.” So what’s stopping you? Lose the weight. Exercise. Get in better shape. Start today. My point is that we… all of us… sometimes limit ourselves with our own thinking, beliefs, outlooks, doubts, excuses, whatever. We shouldn’t be. We need to recognize all of that for what it is and set it aside. Of course we all have doubts. Courage is necessary to move past the doubts and take the necessary actions to attain our goals even though we risk failure. So what? Failure is a learning experience. 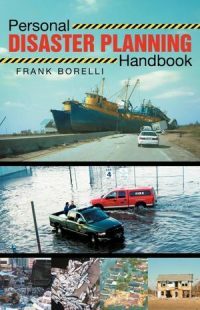 It tells you how not to do what you were trying to do so you can adjust your plan and go again. Are your beliefs limiting you? If so, are they YOUR beliefs or someone else’s that were handed off to you? Something you learned from your parents? An older sibling? Who taught you whatever it is that is stopping you from pursuing or attaining your goals? Ask yourself this: Would that person want you to not reach your goal? And recognize this reality: If that person doesn’t want you to reach your goals then you, for sure and certain, shouldn’t be putting much value in their beliefs. Take a look at that image again. Superman in handcuffs. It’s like someone trying to trap you with tissue paper, but we do it to ourselves all the time. STOP. Move forward.